Independent shops'll feature deals, special doings, and other haps for musicheads. Books and podcasts devoted to social niceties and the art of small talk often suggest to have an arsenal of topics at the ready, the sort of conversation-starters that can help you at a cocktail party, business convention, or family reunion. But also? A stack of vinyl can also bridge whatever silences or social awkwardnesses are afoot. For any two people who don't know each other can generally find a way to strike up a lively conversation while combing through a bunch of record albums, a time-honored way to pass the time when small talk doesn't appeal. If this is something you already live by, and you've made plenty of friends through records, both from the IRL variety as well as important songs you consider to be pals, well, you'll probably have a finyl, we mean vinyl, we mean fine time at Record Store Day. That's happening in 2019 on Saturday, April 13. 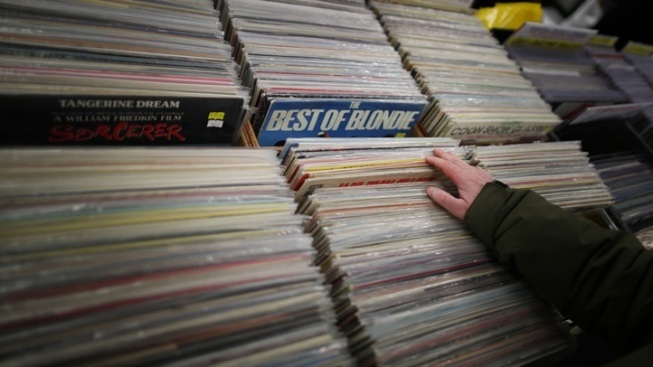 It's an occasion devoted to independent record shops, and whether those shops stock vinyl platters or cassettes or CDs or posters or stickers or all of the above almost matters not. What does matter? Community, yes. Supporting local businesses, absolutely. And maybe discovering a fresh sound or artist, on a record, or a new friend who also happens to be visiting the same shop. A hallmark of Record Store Day? Shops do their own thing. That can mean deals, giveaways, or pop-up concerts. At Amoeba Hollywood, that means a trio of DJ sets from Samira Winter, Gaby Moreno, and Jason Mantzoukas, but every participating store'll have a little something special afoot. Check ahead, if you'd like to know in advance. Isn't a love of music a bit about surprise, though? Like bonding over a bunch of albums with someone at a family reunion or building party? For more on this come-together, love-an-indie, support-your-neighborhood kind of day, click.